"When I'm at a taqueria, it's hard to decide between the chicken with green sauce or with red sauce. Here's my version of the red sauce. 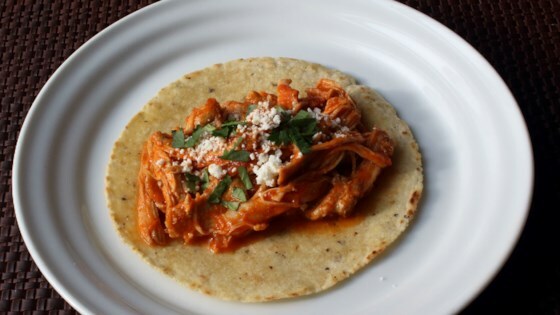 It's great on a crispy tortilla and topped with the usual suspects." Place chicken thighs, garlic cloves, halved onion, salt, oregano, water, and chicken stock, and water in a large pot. Bring to a simmer over high heat; reduce to medium-low. Simmer 30 minutes, stirring occasionally. Remove from heat. Transfer onion halves to a bowl with a slotted spoon; transfer chicken thighs to a separate bowl. Pour broth through a strainer into a large bowl. Heat olive oil in the same pot over medium heat. Add diced onions and cook until beginning to soften, about 4 minutes. Transfer strained liquid to onions. Bring mixture to a boil over high heat; turn heat to medium-low; reduce broth by about half, 15 to 20 minutes. Transfer reserved boiled onions to a blender. Add chipotle peppers and the adobo sauce. Swirl a bit of water in the can and add to the blender. Add tomatoes. Cover blender with the lid. Pulse on and off until mixture is partially blended. Blend on medium speed until smooth, 1 or 2 minutes. Transfer to pot with broth and onions. Increase heat to medium-high. Simmer 15 minutes or so, depending on how thick you want the sauce. Reduce heat to medium-low. Tear chicken into bite-size pieces and add to the pot. Cook another 10 to 15 minutes. Transfer to a serving dish; garnish with crumbled cotija cheese and cilantro. One of the most versatile chicken dinners! You can substitute 3 1/2 cups of any fresh or canned tomato product for the (28 ounce) can San Marzano tomatoes. Can be used on tostadas or in burritos, quesadillas, flautas, or tacos. Top with the usual suspects like shredded cheese, chopped green onions, sour cream, etc. Super tasty! A little time consuming but not hard. Made a LOT of chicken, way more than 6 servings I’d say! I used one pound of drumsticks with two pounds of thighs. Wonderful!! I only used 2 chipotle peppers rather than the entire can, and it was perfect! Even my picky 12 yr old loved it...after he added a ton of lettuce to cool it down. This was very tasty. Followed recipe exactly. Will make often. I followed the recipe exactly how it is and my family loved it!! We are a family that loves spice, but if you’re not used to it, I’d definitely recommend adding less chipotle chicken peppers.